What had happened for Noru to achieve such notoriety? After its birth on July 20, 2017, Noru roamed the Pacific Ocean at a strength equivalent to a Category 1 Hurricane in the Atlantic Basin. However, roughly four days later, Noru encountered Tropical Storm Kulap, causing the two systems to engage in what experts call the “Fujiwhara effect.” After dancing around each other, Noru—the stronger and bigger of the two systems—simply swallowed Kulap, resulting in a much more potent storm. After engaging in this dance with Kulap, Noru crossed over its path from earlier in the week and began heading towards southern Japan. In layperson’s terms, what is the Fujiwhara effect? Discovered in the 1920s by Sakuhei Fujiwhara, a Japanese researcher and meteorologist, the Fujiwhara effect—or, Fujiwhara interaction—explains a phenomenon where two tropical cyclones less than 900 miles apart rotate about a common midpoint. As a result of this movement, the distance between the two vortices decreases. Depending on the size of the systems, as these severe weather patterns circle each other, they have the potential to merge into one storm. Usually, the bigger system will absorb the smaller system. Noru and Kulap engaged in this merry-go-round-like weather pattern around July 24, 2017. However, it is also possible that this binary interaction might deflect the original path of one, or even both, of the systems. How common is the Fujiwhara effect? The Fujiwhara effect is relatively well documented in the annals of weather history. More or less around the same time as Noru and Kulap engaged in their dance, tropical cyclones Hilary and Irwin engaged in a similar ritual in the eastern Pacific Basin, with Hilary’s wind shear eventually weakening Irwin. In 1995, Hurricane Iris danced with Hurricane Humberto, before interacting with, and eventually absorbing, Tropical Storm Karen. There was also major concern back in October 2016 that Hurricane Matthew, a powerful late-season hurricane, could interact with Tropical Storm Nicole, a smaller system that formed and continued to linger in the Atlantic Basin northeast of Hurricane Matthew. Experts feared that after engaging in their cyclonic dance, Hurricane Matthew would take aim at Florida for a second time within a few days, further devastating the area. Superstorm Sandy, one of the largest and most costly tropical storms in the history of the United States, also experienced this effect before hitting the East Coast of the United States in late October 2012. Sandy interacted with a low-pressure trough to its southwest that steered the storm west towards New Jersey. 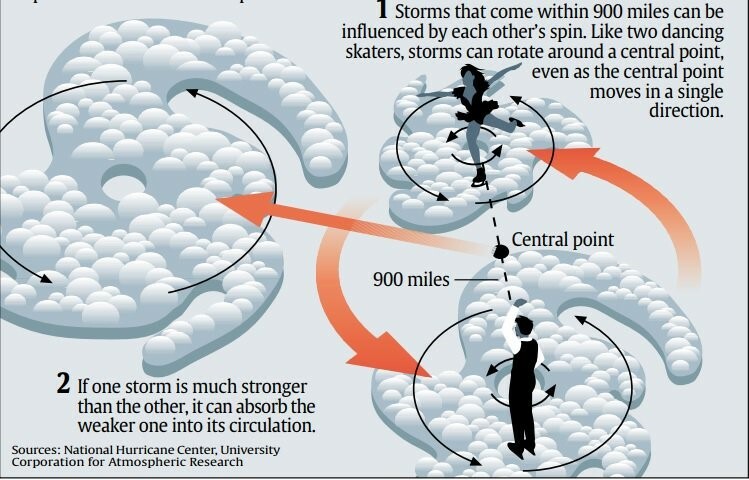 Eventually the two systems merged to form the devastating “Superstorm” or “Frankenstorm” Sandy. What are the implications for the insurance industry? With the 2017 hurricane season in full swing—and the National Oceanic and Atmospheric Administration predicting above-normalactivity—the Fujiwhara effect plays a prominent role in severe weather patterns that the insurance industry has a vested interest in observing. One issue to potentially consider is to what extent a system that undergoes the Fujiwhara effect changes in its meteorological makeup from the original system. As the threat of Hurricane Matthew interacting with Tropical Storm Nicole before taking aim at Florida for a second time has demonstrated, another issue to consider is the number of occurrences. With that said: Welcome to the dance of the cyclones!